Each Thanksgiving a cliché struts about the dinner tables of the American landscape: What are you thankful for? The nice thing about an irregular blog is I can take my time thinking about it. “I hope everyone had a great Thanksgiving holiday, I know I did. As I spent time with family and friends, I gave thanks and appreciated the things that I have: my health, my sisters, my dogs, everything that makes my life as good as it is. You know what else I’m thankful for? “Ramps. Ramps are crucial to my happiness. “I’m thankful that I was born in an ADA (Americans with Disabilities Act) America. The ADA was a law passed in 1990 that requires most buildings to be handicapped accessible and prohibits discrimination in any way due to an individual’s disability seeking employment, and in other capacities as well. This is rare for me to say but, thank you politicians, for helping to make my life easier. “I always say that I want to go back in time and live during the days of classic cars and … sports on the radio… , but honestly, it’s not a good idea. It was almost impossible to live a relatively independent life. “Back in the day, people with disabilities were marked as a fatal flaw almost right off the bat. Not that I was really there, but I know people who were. Medical technology and equipment used to assist someone with a physical disability was, for the most part, in its early stages. From what I’ve heard and read, a lot of families put their children in homes to get care, and they were not integrated into society at large. having a disability was seen by many as a weakness, and something to be ashamed of. “One of the most prominent examples of this would be Franklin D. Roosevelt (FDR), who was diagnosed with Polio in 1921. FDR was confined to a wheelchair in his later years as President of the United States, but did what he could to hide it from the public, refusing to have his picture taken in his wheelchair or with his leg braces. Maybe this was partially because of his own personal pride, but I’m sure it was also partially due to the notion that the American people would have seen him as weak and unfit to lead the most powerful nation in the world…. At the moment I’m listening to gorgeous acappella harmonies from South Africa—the beauty of music to transcend culture, color, and intellect to make tolerance not something from outside in but the inside out. And now I am thankful my liberal education because my liberal education did not just study poetry, it spoke poetry, it did not just study music but played music, it did not just observe art but made art. My thumbs in the clay may never create a decent clay pot, but the awkward cameo they did make a long time ago at Saint Gaudens Garden (The moniker I use to refer to the St. Gaudens National Historic Site in Cornish, N.H.) is enough to bring all sculpture visceral. My fingers can only stretch enough to play three chords on my bouzouki, but those three chords resonate from, inside my body out and are enough to make all music a wonder to me. Perhaps Thanksgiving and the holidays are clichés but they’re clichés we need to keep forcing upon ourselves to keep curmudgeons like me from forgetting there really is lots to be thankful for. 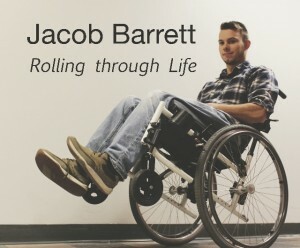 Ps: Jacob Barrett showed me his wheelie yesterday. I asked him to let me know when he burns some rubber. September 12, 2015, 6:31 p.m.
How does one sum up a summer on the other side of the planet and somehow try to get a halter around a globe that both separates and conjoins us. Spock would dryly comment, “Fascinating,” but riding a half-Vulcan horse doesn’t cut it when one tries to corral emotions which slip intellectual harnesses like smoke from a nighttime campfire glowing somewhere in the ancestral past. When stymied, often hearing the traditional music of distant cultures helps provide some toleration. IN this case, it is “Uyaclaima” (Means boasting) by the African group Amaybtho. Perhaps a sensory trip to the musical ranges of Africa will keep the mind from fencing itself in. So with African traditional music in the ears, the mind on China, and the feet planted on American hardwood, let’s see where this goes. Shortly after I left Shanghai this summer, came the seismic industrial explosions in Tianjin on August 12, 2015. An explosion that has killed lamost 200, injured a thousand, and destroyed or damaged 17,000 homes. It makes it hard not to see China repeat the mistakes of rapid industrialization we made in the United States a century ago. For example, lest we forget ourselves in the parody trumpeting claims of U.S. exceptionalism , there was the Triangle Shirtwaist Factory Fire in 1911 or the Battle for Blair Mountain, West Virginia, in 1921, or the underreporting of African-American deaths in the Tulsa, Oklahoma, mob that destroyed much of the black Tulsa community as 36 when the actual total was likely closer to 300. Or if those events aren’t historically close enough. Do not forget only a decade ago, Katrina may have killed 2,000 in New Orleans alone. No one is quite sure of that either. Certainly all these lessons have been available but when profit is the dominant motive, it doesn’t matter if the society is managed by capitalism, communism, or fascism because profit is its own lover and woe to anything that comes between a narcissus and his face. When profit is the motive, three–piece suits act no differently than the half-naked laborers in Sebastião Salgundo’s photographs of the Serra Pelada gold mine. The body language of gold fever whether at the penthouses of Wall Street or the halls of Congress, the docks of Tianjin or the fracking pits of Marcellus Shale is the same. Chinese leadership still has vestiges of its Great Wall thinking that began a millennia ago and reached its peak in the 19th and 20th century attempt to control outside world influence by limiting access via enclaves in certain cities, a withdrawal from the world which costs China dearly in the mid-twentieth century. Now it seems the government will attempt to recreate those walls electronically by cutting off Youtube, Facebook, google et al and substitute Wechat or Weibo. It didn’t work before. I doubt it will work now. Most human beings are just too curious and some are too greedy. If at the macro-level China operates with one-hand clapping, at the micro-level, life felt far more positive. In tea shop conversation after conversation, the population was well aware of the shortcomings of its leadership and its system. But they also are living better than they have ever dreamed. Considering the debacle of Citizens’ United and political discourse in the U.S., who’s to say which is preferable. Another example of positive movement might be air quality in the south. In October of 2012, the air pollution around Hangzhou only a hundred miles south of Shanghai was what I called “catastrophic.” Though I only spent a week there, I felt the effects in my lungs for weeks afterward. This time, in four-and-a-half weeks of visiting the same region, there were only two days when the lungs burned and air quality brought on headaches. 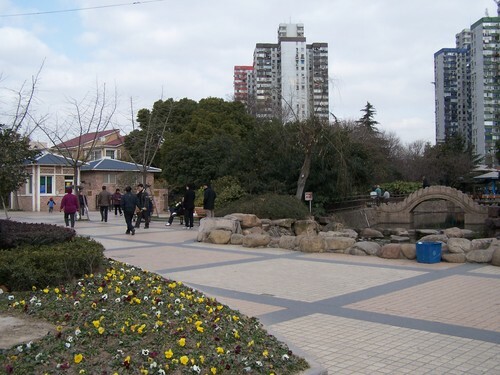 The likely reasons for this improvement are these: Spring has better air quality than autumn; this longer visit occurred at the same time as an unusual weather pattern occurred, or China has made some progress on cleaning up its air. Realistically it’s probably a combination of one and three. No talk about weird weather arose in those weeks. Still it was a surprise to live in a city where the air quality is much closer to the Philadelphia of today rather than the Los Angeles of two or three decades ago. Water quality has improved less successfully. The Yangtze, the Huangpo which separates The Bund from Pudong districts, and the Wusong River all have a worn, industrialized look about them. 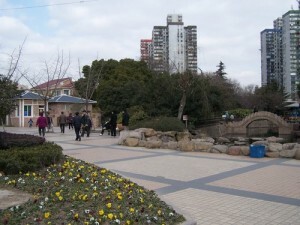 But, water in the large parks is different, the lakes and ponds of People’s Park and Fuxing Park are clear and lovely but retain an air of artificiality about them, almost like a clean bathtub. 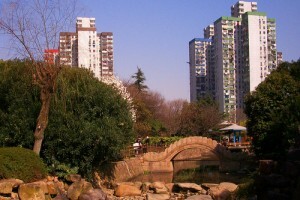 More exciting though are the small neighborhood parks that incorporate a small river (Zhou Jaibong River) along Shuicheng Road. This was flowing water and should have had that same silty, used look that comes with an urban setting. Not so, the river water here looked as pristine as if it had been meandering through miles and miles of forest. Somebody somewhere was keeping that water clean and because it was a river, it meant the water flowed. I think of how, in the 1960s and 1970s, the Nashua River running through Fitchburg and Leominster, Mass., changed colors each day depending upon what dye color was used in the mills. Today it is a sanctuary. If we can take care of the water, I suspect everything else will follow naturally. though squeezed by high rise, still find their way here. these flowers grow well here. September 3, 2015, 3:13 p.m.
Farish’s comment made me realize how much the concepts by this New Hampshire public policy professor at Harvard and philanthropists such as John and Karen Hofmeister are instrumental in getting one to rethink how those who hav e done well in our culture should fund art within a community. The germination of this idea began with George H. W. Bush (I) who promoted the concept of “A Thousand Points of Light” toward the arts during his presidency. He likely considered the MFA or MOMA as one of those points of light. Robert Putnam’s work allowed me to grow the idea to maturity by setting those “points of light” within much less wealthy communities. So hypothetically here, let’s say a philanthropist had a million dollars to give to the arts. (Being a poet, I choose a million to make the math easier.) The philanthropists could give that million to the BSO and fund one position at say $50,000 annually . Or he or she could create one hundred $10,000-dollar endowments to fund one hundred $500 annual projects at the community level. I believe those one hundred smaller projects would, to tweak Ronald Raegan’s concept, produce “trickle up” community-passionate creativity which would then provide the BSO or MOMA with all kinds of vibrant new ideas from which to choose. For evidence this concept works, I offer the Worcester County (Mass.) Poetry Society which through the initiative of Robert Steele, twenty years, got a grant to produce an endowment for The Worcester Review. That . worked os successfully, the WCPA now has four endowments which annually fund poetry projects for the greater WSSorcester community. The Monadnock Writers Group just successfully created a $10,000 endowment to help pay its monthly speakers a small, honorable, honorarium. 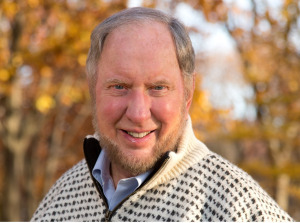 (Robert Putnam was one of those speakersJ And right now the Poetry of New Hampshire Society is creating an endowment to permanently provide every future N.H. Poet Laureate with a small annual honorarium to go about his or her poetry work in the Granite State. August 3, 2015, 4:17 p.m.
Because shanghai is built upon a marshy coastal plain, lakes and rivers crisscross the landscape, and with all those people come the canals as well. For the pre-industrial age, water travel made far more sense than roads so villages grew up along the waterways and canals much like Venice (though not as metropolitan). A number of them have survived the Twentieth Century and are now re-invented as tourist destinations. Zhujiajiou (My best Western guess is Zhoo/jee-ah/jee-owe) is one of those recent ones because in the China historical paradigm, it only goes back 1700 years. This was our first excursion without a native speaker. Olivia, our SUIBE administrative assistant, drove us to the Songjian bus station and got us on the bus without experiencing any of the “bumps” she told us she had added to her shiny, new, black SUV. She said simply, “Get off at the Zhujiajio bus station” and drove off. Since the busses indicated the stops in both English and Chinese, this would be a good, early test of our ability to navigate the Shanghai landscape. We figured we could handle it despite the nerves and put our trust in the natives. We got off at the stop when the sign indicated “Zhujiajiao” and the other riders nodded encouragement—this was it. Then we walked out of the station, turned away from the highway and ignoring the pedicab drivers imploring our service, walked until we reached a bridge over a canal and managed to spy only one small sign with English subtitles which pointed to “village” and “toilets.” For tourists, that seems to be about correct. For these two on-our-own discoverers, that also seemed appropriate. 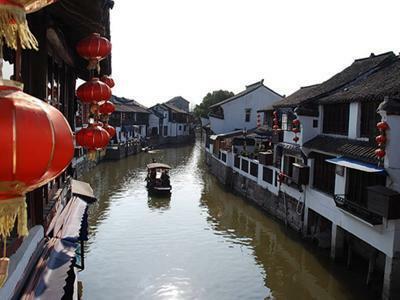 This was mid-May, mid-week; there were no crowds and this village, unlike Yangchow’s Ming Dynasty recreation which though lovely felt too much like Colonial Williamsburg, Zhujiajiao was a working village with one side of each home facing a canal, the other an alley wide enough only for pedestrians, bicycles, and scooters. Artisans and laborers lived in these rickety waterside houses. And they lived in them with all the trappings of any lived-in home—trash, dogs, laundry lines, music, and children too young to attend school. Once one meanders into the village proper, the artisan’s shops and tea houses appear. With the mid-week sidewalks empty of travelers, we had our choice of tea houses for lunch and so chose a tiny shop with a balcony consisting of two tables overlooking a canal not much wider than the alley. The menu was slim but we were hungry. A young woman made us tea and boiled up a hot, dumpling soup in front of us—after she went next door for a few more ingredients. Like Vietnam, locally made, hot soups were the most pleasurable meals to be had—my favorite soup was served at a small restaurant called “Three Beef Treasure.” I never tired of it and ordered anything that looked close. It worked well. Despite, the heat, that first taste of everyone brought chills. One of the things I am missing here in the States is finding some meat-filled dumplings and egg noodles to make my facsimile of a Vietnamese or Chinese sidewalk café soup. In the shops, the prices were far more reasonable than say at Yu Garden where a lovely porcelain tea set held a label for 800 rmb (The rmb or yuan is the Chinese equivalent of the dollar, currently about 6 to a ollar. 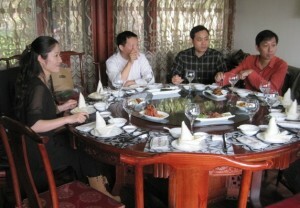 ), but in Zhujiajiao it was priced at 100 rmb. In both places one is expected to haggle, but I’m not as good at it as my daughter. I had to leave after the original offer was rebuffed and I realized I wasn’t as hagglely good as I had hoped. I returned in the afternoon on the way out to get it for 85. Returning to Shanghai, loaded with gifts, from the Zhujiajiao bus station, a bus station with very little English, also worked out well. We had learned to navigate the Shanghai Metro so if we could get to a metro station all was fine. I said Shanghai, the ticketmaster took about eighty-five cents worth of rmb and pointed vaguely to a bus. We got on, looked puzzled, and someone said, “People’s Square. You’re ok.” and so it was and so were we because People’s Square is the metro central in Shanghai. In ninety minutes we were there and on the metro back to the SUIBE. where dry, plants rustle in the cold wind. July 11, 2015 6:57 p.m. I first saw China from an airplane flying R&R from Saigon into Hong Kong in 1967. Lying limply in the bay below just off the runway, lay the fuselage of a passenger plane that had crashed a week or so earlier. It looked nothing so much as like a giant, broken albatross waiting for someone to drag its carcass out of the shallows. And then, once on the ground and headed toward The Imperial Hotel, came the great cliffs that loomed over the city like some sleeping Godzilla. Behind those cliffs, I thought, lay the forbidden world of China. 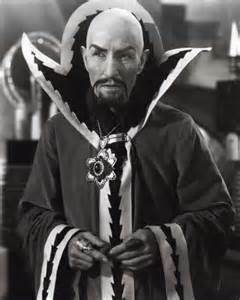 I did not know that the colony of Hong Kong actually spread fifty miles beyond those cliffs so the impression stuck–not in the least helped along by childhood fantasies from Flash Gordon’s Mongo emperor Ming. The United States of the 1950s might have been even more universally xenophobic than Fox News today. 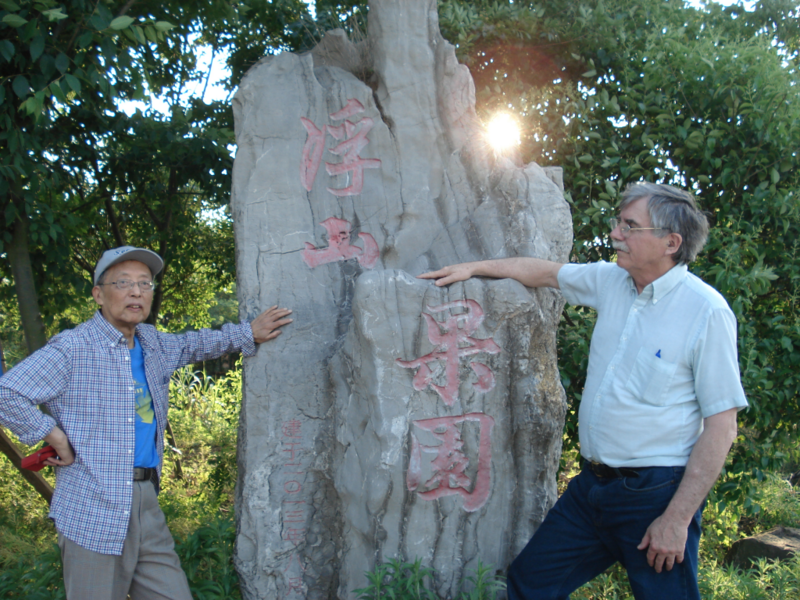 Forty-five years later I returned for a week to the City of Hangzhou and its literary festival at West Lake. This time the week was filled with banquets, readings, lectures, sightseeing from breakfast until sleep. Other than the witching hour walks around the silent hotel because I remained on Eastern Standard Time, there was little opportunity to feel the country. In May of 2015, a longer five-week trip was built around work in Shanghai with a lecture on each Monday and each Tuesday, the rest of the week vacant to follow one’s nose. 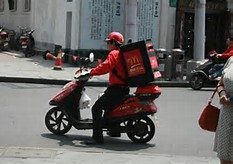 Walking around Shanghai is much like walking around New York City. It looks almost the same. It sounds almost the same, it smells almost the same and then suddenly comes the sensation that something is off, different as if one has stepped into a parallel New York City—a universe running side-by-side with New York but slightly askew. It’s more than the time change which is exactly opposite to New York–noon is midnight or vice versa. That is a start, but it’s not enough. One could say, well, the people look different, but after a week they don’t—unless you are sitting in a Starbucks and a mother with a young child walks by and the child stares intently at you knowing something is different about you, but he or she just can’t place exactly what that “different” is. No, after a week people become just people with all the idiosyncrasies people everywhere have. That pedestrian walking down the street reminds you of a friend you once knew in high school. Or that one over there looks like your uncle or your brother’s best friend. That girl reminds you of a girl you once took to a dance. 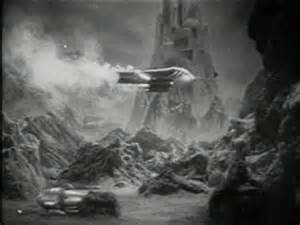 That is the human future which must be embraced because the alternative uses uncertainty and fear to manufacture trappings used to paint people as different and therefore less worthy, an alternative, with the weaponry we have today, that won’t send us back to the Dark Ages but rather back to the Stone Ages. After a week, you sit down at a restaurant and the conscientious waitress brings you a fork, and you look at it and wonder what is this thing? You feel the universe jiggle and you remember, oh, that is the other New York, and then you pick up the chop sticks and enjoy your alternate meal. Maybe the silence imposed by not knowing the language forces the other senses to the fore, but whatever it is, it is as close to a non-drug induced out-of-body experience one might get. Each day my daughter and I walked the blocks around our hotel. Each time expanding the area by a few square blocks and soon the neighborhood really was a neighborhood. We began to forget this was not New York. And if the need to reassure oneself that the other New York was real, there were plenty of McDonalds and Burger Kings within easy walking. Inside those Golden Arches, a bacon double cheeseburger and fries tasted just like the bacon double cheeseburger and fries in Jaffrey, New Hampshire. Balance restored, people became people again until out of a side door steps a man dressed like a Ghost Buster, a square box on his back in which stacks of Mickey D’s were loaded for delivery on the back of a scooter and the universe jiggles again. Upon return, friends said it takes one day for each hour difference to re-acclimate and I will attest to that. But it’s been a month now and something else has shifted. As I walk down the quiet of this road in rural New Hampshire there is this sense that the macadam is no longer as solid as it once was, and I wonder if the universe will jiggle again and the pavement I stroll on has switched to that other New Hampshire. But there is still much more to tell about this parallel universe, and I shall get to that shortly. ps: Today typhoon Chan-Hom just nudged Shanghai and I wonder if Shanghai Metro pictures will soon remind one of New York’s Hurricane Sandy photos. pps: 8-6-15: The typhoon skirted Shanghai, but we shouldn’t forget Mother Nature keeps to her own time. It was just before dusk on December 17, 1967, when a Vietnamese, likely an NVA spotter, looked out across the road junction at Thien Ngon and decided this shirtless GI standing alone by his bunker would make a good opportunity for the first shot from his mortar section. He then would direct his team to lay down a barrage along the foxholes of the Vietnamese/Cambodian CIDGs just in front. The plan went smoothly enough. The first shell landed about six feet behind the GI and blew him into his bunker. The rest produced 24 other medivac patients who joined him along with 1 VC hit in the counter fire. 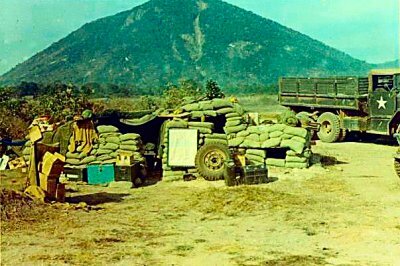 The 45th Surgical Hospital at Tay Ninh stayed busy that night. That lone GI who stuck out like a sore thumb was me. 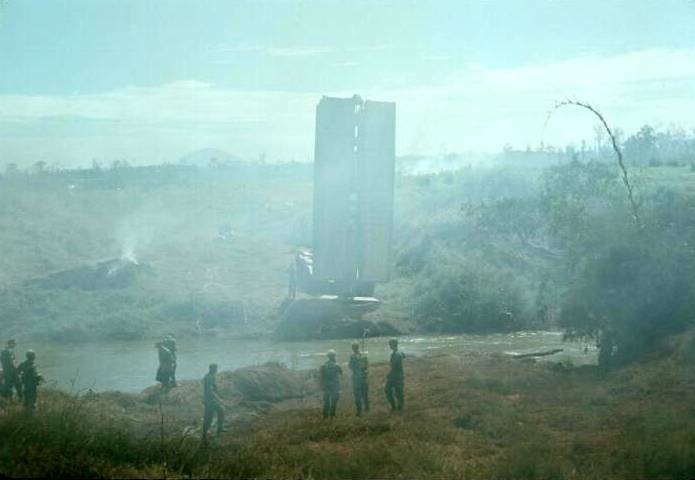 Such was the way of combat engineers building a Special Forces camp along the Cambodian border in 1967 and 1968. For twenty-five years I had convinced myself that first shot was an accident. After all, I’m a nice guy. Who would want to shoot at me just because I was a GI doing his job. But when I met a North Vietnamese writer at the Joiner Center at UMASS Boston in the early 1990s, who had fought in the same area at the same time, he let me know it was not likely an accidental overshot, but a carefully calibrated shot at a target of opportunity and so, that long-held innocence required reconfiguration. 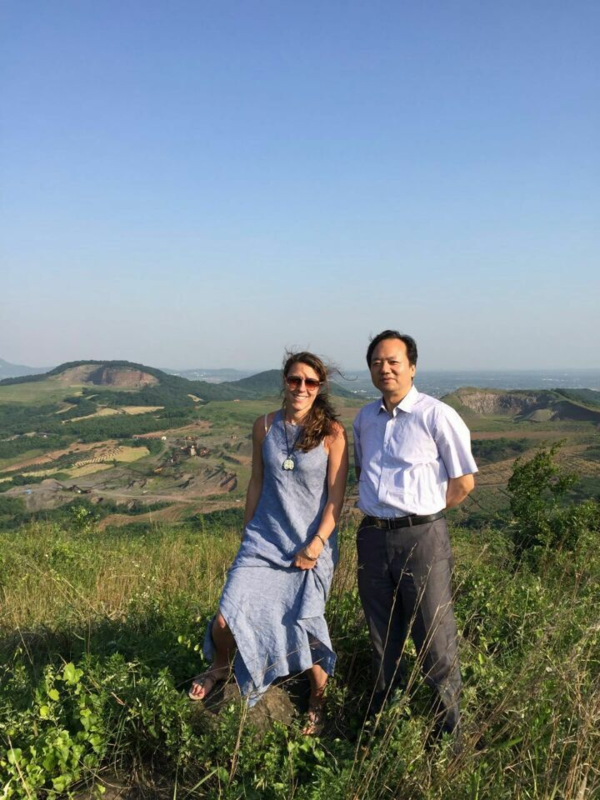 It felt fitting that if I were to return to Vietnam to set foot inside the Cao Dai temple and climb Nui Ba Den, then it was also fitting to go back to that road junction and stand upon the spot I last stood on the evening of December 17, 1967. Made sense to me anyway. 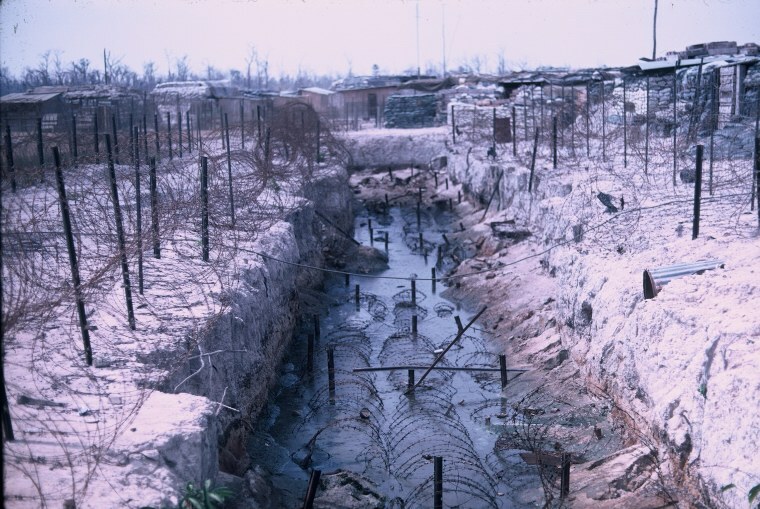 This is what that spot in War Zone C looked like in 1967. The scissor bridge over the Soui Ky River. Nui Ba Den is just visible on the horizon. Each day we put it down, each night took it away. And below is the kind of protection we quickly put together for ourselves until the A323 was built properly. 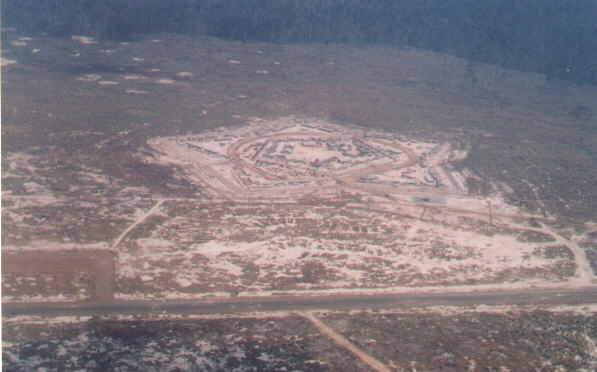 (It took about a month for the camp to take the shape which eventually looked like the photos further below.) 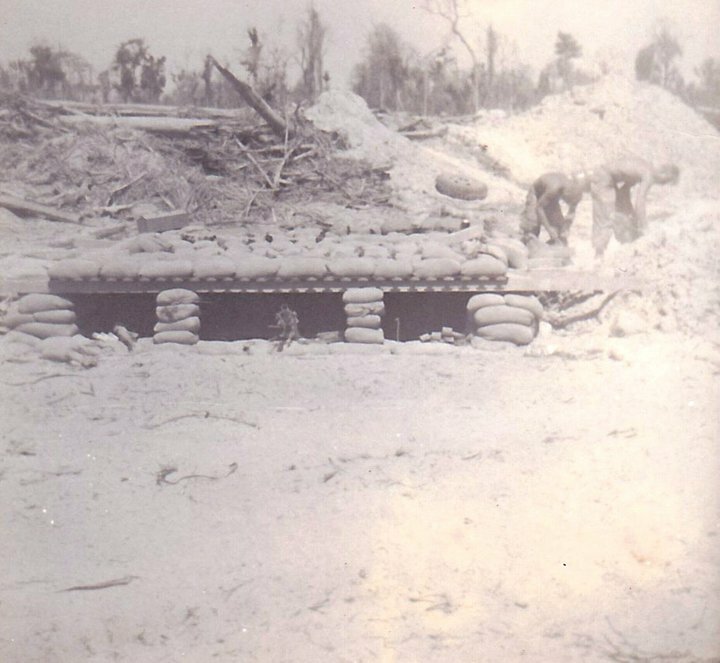 This was a typical combat engineer-constructed bunker at Thien Ngon. 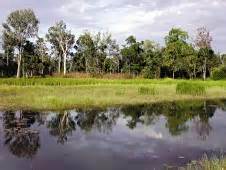 My three-man bunker was located directly at the junction of two dirt roads leading to Cambodia so that finding that location forty-seven years later was not difficult. War Zone C in this area, only a few miles from the Cambodian border, was a free fire zone and the landscape showed it. 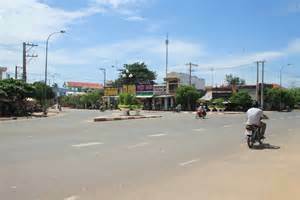 Today it bustles again as Highway 22, a truckers’ trade road to Phnom Penh. If one were to dig up the asphalt in the photo below, my bunker would have been located about midway between those two scooters. Normally asphalt, concrete and wire-strewn poles might construe a development-wrecked landscape. But not here. Not today. Here and now, that construction became a poultice and antiseptic on a seeping wound. A village has evolved from a battered landscape. fall so wouldn’t cry out for hearing. lush in its early rainy season thirst. There was an old priest who remembered. turn up, tarnished reminder of the ugly beneath. A323 is gone, replaced by a national park for trees. For once someone did it right. In retrospect, this is the thing I most wanted to see by returning—a land healing itself, a land of ninety million bustling people where likely more than two-thirds of them were born after 1968 and to them the only difference between the Japanese War, The French War, The China War, and The American War is a page in a history book—much like American youth where Vietnam, Korea and WWII are of the same set of pages—but unlike American culture, I don’t recall a battle site in the U.S. turned into a national park for trees. 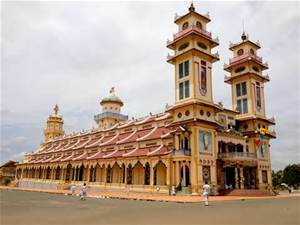 Tay Ninh’s Cao Dai Temple is a creation in color of a 1920s French-Vietnamese philosopher who sought to merge many great one-god religions, including Christianity, Judaism, Islam, Buddhism, Confucianism and adherents of some unusual icons such as Julius Caesar and Sun Yat Sen under one God. If one looks carefully, one can see altars and icons to each placed along the length and breadth of the temple. Even the All-seeing Left Eye of God, also the Masonic Eye of God, appears as one of the major symbols of the religion. Considering the track record of the most of these religions, philosopher Ngo Van Chieu. 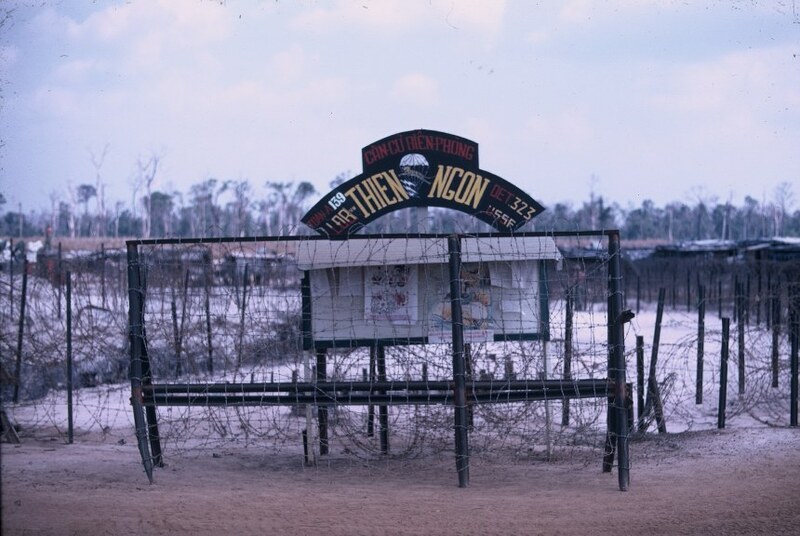 For soldiers, the temple in Tay Ninh, was as prohibited a place to visit as Nui Ba Den. We were told not to go in not disturb its services. There were also stories that this non-violent religion had its own military branch for protection. I suspect army officials decided one civil war at a was enough to occupy their imaginations. Therefore, like The Black Virgin Mountain, the prohibition against entering this giant, almost mythical dragon of a building made the temple that much more alluring. The was even an other-worldly story that deep inside the temple a huge gemstone levitated for the faithful. To remove one’s shoes, enter and observe a service becomes a must for a returning visitor. Even the local troop of mnoejys has acclimated itself to the timing, using each of the four services when human beings are most dispersed, as opportunity to climb down from the trees in the garden on one side of the wide avenue entrance to the temple and saunter over to the trees in the garden on the other side. 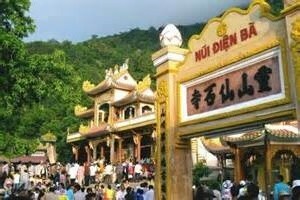 Four times a day, a Vietnamese folk orchestra and chants fill the temple in worship. Regardless of one’s beliefs, it is a moving and sincere ceremony. How different the world might be had Harry Truman, Ho Chi Minh, and Charles DeGualle been forced to remove their shoes and meditate together until they resolved their differences in 1945. 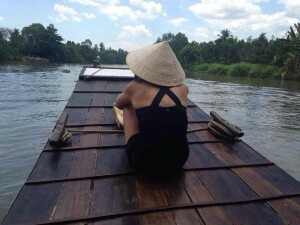 Always in sight rises Nui Ba Den, The Black Virgin Mountain, which dominates the landscape and history of the cities, towns and villages northwest of Saigon in Tay Ninh Province as much as Mount Monadnock dominates the Monadnock region of New England. 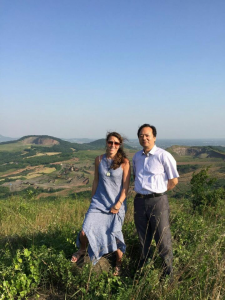 Nui Ba Den is an extinct volcano which rises over 3,000 feet directly out of a coastal plain so level it might reach a little over 200 feet above sea level sixty miles from the sea. No matter where you are in this province, Nui Ba Den is somewhere in the background. The mountain invites one to climb it but in the American War in Vietnam that posed a problem for all sides because v we controlled the top with a radio station and the bottom with a rock quarry and military outposts. The VC controlled everything in between. They mostly left the quarry alone. My guess is because it was operated by the combat engineers ( B Co., 588th CE mostly) and generally the engineers provided tax-free infrastructure for the region by building and maintaining roads and bridges and then repairing them again after a mine explosion or a flood or whatever. The top was harassed fairly regularly and overrun at least once. But pretty much during my time there (pre-Tet) both sides left each other alone. Rumor was the VC used the lava tubes as their R&R center. An Patton tank soldier at Soui Da, a small base camp off to the side of about where a theme park is built now, told me every morning a VC or NVA soldier would appear at the entrance to one of the caves, make a commotion, fire a round or two, and we did the same in return so that both sides could honestly report they had completed their assigned mission for the day. His story also said that the VC allowed Vietnamese women carrying jerry cans of water to hike up the mountain and deliver water to our radio station at the top—but required a tax payment of course (and also collected for themselves some water in between at a bargain rate). 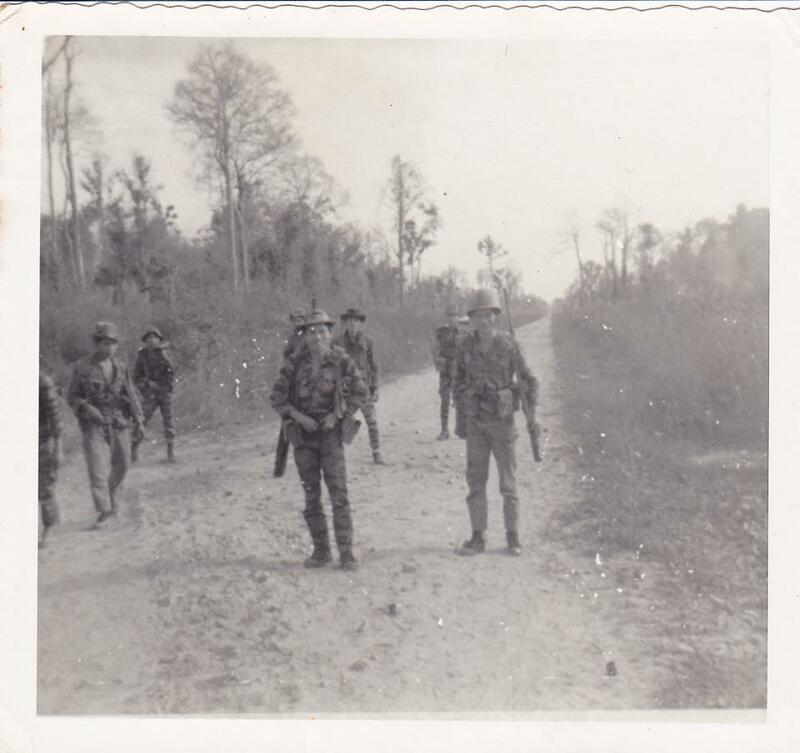 Can’t vouch for the truth, but I can vouch that I saw Vietnamese women lining up in the morning alongside the road I had just mine-swept–each with one or two five-gallon olive drab metal water containers I was then and am now impressed with that work/weight ethic. I don’t recall anyone being particularly upset. I thought it very ingenious. After all, the women who cleaned our hootches and filled our sandbags, if they liked us, let us know which roads we ought to drive on and which not. In our company at least, everyone was very respectful to the hootch girls. We also knew they were likely mapping out our hootches for future VC use. That’s the problem the U.S. leadership never acknowledged, but most soldiers quickly figured out—this was a civil war and civil wars, likely family spats, have all kinds of contradictions and mixed loyalties involved. Chreck out Vicksburg, Mississippi, on July 4 for a current and American illustration. But I digress. I desperately wanted to climb that mountain and couldn’t in 1967-68. Returning in 2015 afforded the opportunity to cross that goal off the bucket list. What I didn’t expect was to see someone building a Disneyland-like theme park at the bottom with a gondola almost half-way up to a series of Buddhists temples and a rope climb trail to the top. 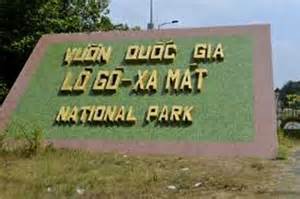 The park is located just about where the old outpost was situated on the last defended spot along the supply road to Dau Tieng beyond the mountain. It was one of a couple of graded roads aptly named Ambush Alley. One can now climb for free but I opted for the gondola ride despite its fee. The view is expansive and provided the view that any combat veteran desperately needs to see—a landscape which 50 years ago was being plowed under, blown up and defoliated into a massive, toxic Superfund site, has been washed clean, fertile, and productive again. There are still scars if one looks closely, notably the Agent Orange photographs in the War Museum in Saigon. The cost to the Vietnamese population and many American veterans has been enormous, but the landscape has recovered. Likely the constant and heavy rainfalls of the annual monsoons have done much to wash away the damage. Trading carpet bombings, fire fights, and ambushes for theme parks is a trade that should have made in 1945. 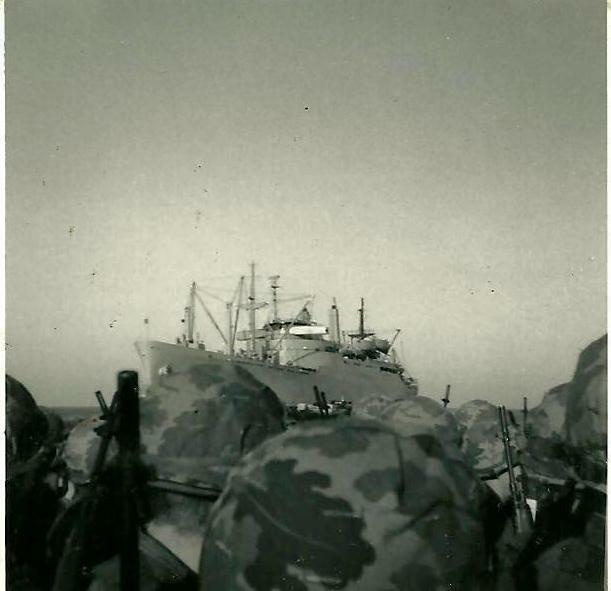 48 years ago the troopship USNS Barrett dropped anchor at Vung Tau harbor, Vietnam, its beaches rimmed by high, green ridges. As the heavy iron chain echoed like gunfire through the hollow decks, soldiers everywhere not accustomed to the real thing ducked. Later we disembarked onto LSTs . . .
. . . which sailed out of the bright sunlight into a seen right out of Heart of Darkness–giant corrugated roofed warehouses stacked with Conex containers beneath the dark shade inside. Atop those stacks lolled workers on afternoon break, high on the local smoke of choice. 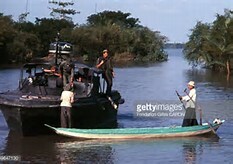 Once ashore, considering the distance to our final destination at Cu Chi, were this the states we could have driven there. But this was not the states and the Delta was not then, nor likely ever, ours to drive. So we loaded onto the ramps of twin-engined C-123s and flew out. roads, a minor consequence of getting about. Deliveries, sales and visiting move more easily via boat than truck which makes time in this place moves at the speed of the delta. This is also the land of jasmine rice which, which according to Thanh, our guide, so far biologists have not been able to successfully replicate anywhere else on the planet hence a prosperity here for those practicing agriculture missing elsewhere. 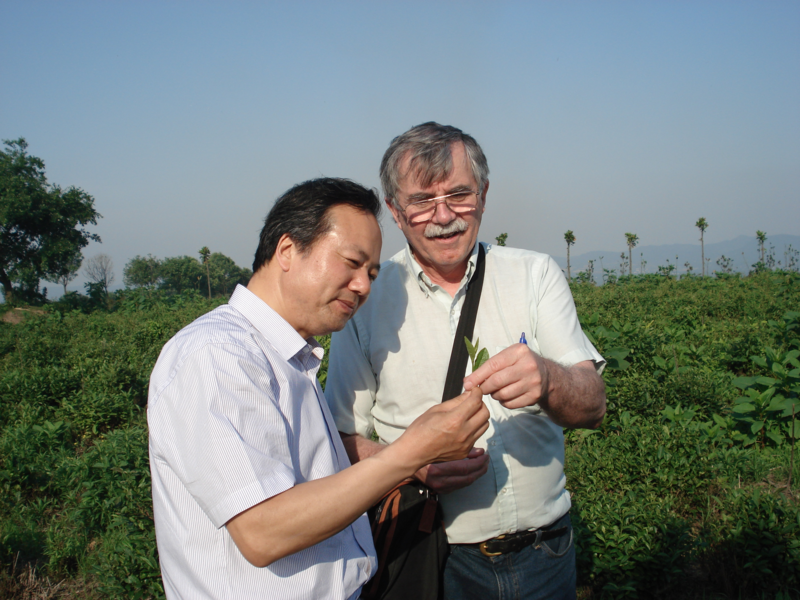 He said he believes there is something about Mekong water and soil that contributes to Jasmine rice’s unique taste. Both water time and agriculture time leads one toward to contemplation. The French influence has not faded with time. Lunch is served in rthe old French style at a small local restaurant by Vietnamese women holding parasols, dressed in their traditional Ao Dai. This was a place to pretend, to enter not a fifty-year memory of war but of a century-old colonial minister in white silk suit with white fedora who spoke only Gallic. The French influence is still strong, especially in the presentation of food. Elephant Ear Fish, the local delicacy, is cooked, decorated, and served upright on a wooden plaque with Jasmine rice, various fresh vegetables all presented so as to highlight the fish. Ceiling fans slowly turned to provide a gentle breeze to ease the afternoon heat. 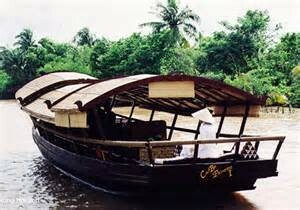 When we returned to Saigon, the Delta life style completely disappeared in the rush of afternoon traffic. Our guide noted, “Vietnamese are born on scooters.” China traffic may have been proof of evolution but Saigon rush-hour traffic is natural selection pushing itself to some new frontier where highways become meeting places for hundreds of thousands of scooters moving mostly in one direction or perhaps two, but with enough opposable and crossing patterns that any semblance of a plan dissolves and one gets the sense this is chaos theory at work and much like being inside a swarm of bees. 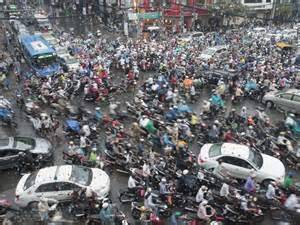 As the driver of the car noted, “Saigon has nine million people and at rush hour two million are on this road. But it’s not just two million drivers. Many of the bikes have two adults with up to two children on them as well and only the driver holding on to the steering handles. Yet in a week there we observed no fender benders and only one example of temper—an outburst from some scooter operator with the unmistakable voice of an American. If there is one place in the United States that manages to reflect the vast contradictions that are these oddly amalgamated collection of 50 fake republics, Harlow’s Pub (moons ago just tiny Harlow’s Deli) in Peterborough, New Hampshire, has somehow managed to manifest itself as that artifact. I doubt there is another place on this planet where a patron can find a list of Egyptian Hieroglyphics on bad drunks posted at the bar while nearby on the wall hangs an American Gothic portrait of a woman who, God’s truth, looks remarkably like a portrait of the hooded World Champion Patriot’s coach Bill Belichik, the Yoda himself. Harlow’s is a combination of British parlour pub and Old West Saloon, coupled with a New England Winter wrapped in a Peruvian family’s hand-woven alpaca scarf tossed onto a Mississippi Delta Blues player scheduled for a Saturday night grind. So funky is this collection of the planet, that should Doctor Who step out of the red UK call box in the corner, he would halt and question whether he had just stepped out of or into the Tardis. 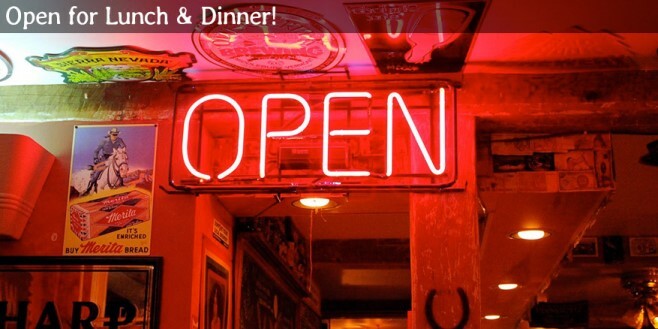 The beer collection is as eclectic as the atmosphere and the food. Meanwhile the Hungarian mushroom soup works its spell as if a gypsy caravan had just sidled next to the old clapboards and poured its magic into the pots boiling in the kitchen. 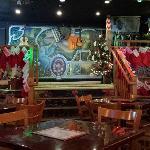 Where else in America can one visit on an early Monday lunchtime afternoon and find the indoor music stage converted to a playground filled with children noisily entertaining themselves with the toys while their mothers gather at various tables for beers, bites, and gossips. At one point a young toddler wanted another toddler’s toy and predictably when she didn’t get it, began to scream self-righteously for about three seconds then noticed not a single adult or child had paid her the slightest attention. Quizzical, she quickly shut it down and picked up a free toy nearby and rejoined her playmates. Not a mother, diner, wait staff member, or bartender batted an eye. This is Twenty-first Century babysitting at its best: Good company, good food, good beer, children being children, and moms being moms. There were probably dads there too, but I hadn’t noticed. At night that playground is turned over to the adults. The nursery becomes a music stage for Sheep Dip (a local band). A reasonable listing of the monthly schedule indicates that the music is as varied as the town boundary markers hung from the ceilings and the Victorian ads on tinplate attached to the walls. Tuesday night: Celtic, Wednesday night: open mike, Thursday night: Blue Grass; Friday and Saturday nights: bands with names like The Deadbeats, Mardi Gras party with The Folksoul Band, Great Groove Theory, Congo Sanchez, Ghosts of Jupiter, and grateful spirits still rising from The Dead. To enter Harlow’s Pub is to let yourself enjoy a psychedelic tour with a hot pastrami sandwich and a creamy Murphy’s Ale as your sidekick. And if you need a book, saunter over to The Toad, one of the best indie bookstores in the world. All this right next door to Nonie’s Bakery/Café which is reputed to have had some influence on Thorton Wilder and Our Town. Though, If Thorton Wilder had known Harlow’s Pub, Our Town would have taken on a decidedly different flavor. JANUARY 24, 2015 4:01 p.m. Here snow lightly carpets winters floorboards. The woodstove seamlessly heats the rooms. A copy of The Twelve Caesars sits on the desk and a soft banjo and cello sift out of speakers in the background. And on this LED screen, Reuters headlines show a new assault in Ukraine, ISIS has beheaded a Japanese hostage, and Oklahoma got the ok to speed up its own executions while the executed said, “My body is on fire” before the microphones were shut off. Add to this, American airwaves inundated with endless mouthings about under inflated footballs which, as reporter Billy Baker from the Boston Globe shows, when comparing the two footballs, is not only embarrassing but shameful considering the amount of time, energy and money this culture has invested in it. So how does one reconcile all these incongruities? Look objectively at the numbers about war and peace in the 21st Century, one should rejoice, because if Steven Pinker of Harvard and Andrew Mack of Simon Fraser University’s work is accurate, when one measure man’s violence against man, the planet is much safer in the Twenty-first Century than it was in the Twentieth. Why then does it feel as if we exist in a world at war poised at the edge of doom? There’s got to be a correlation between the rise of mobile devices and portable notebooks and this increasing sense the world is overrun with humanity’s monsters. Increasingly we rely on a two-dimensional screen, whether it be a flat screen tv or a mobile device, to depict the three-dimensional world and because of our marvelous oh-so-human ability to suspend disbelief, (That delightful academic jargon for what any five-year-old will tell you with complete honesty and accuracy, “You mean Let’s pretend?”) we physically react to what is represented in only two-dimensions on that screen as if it is the reality surrounding us in three. Human beings have always had the ability to do this. We do it for plays, movies, and books where we cry, laugh, jump, cheer as if the event before us is real. But for most, a film ends and credits roll , or the curtains drop and we walk out of the theater or we close the book as The Twelve Caesers is now, get up and walk away—the suspension is over, we leave our pretending and return to the three-dimensional world. Moved or changed perhaps, but clearly aware of the difference between pretend and real. But somehow that distinction between reality surrounding us and reality as depicted on a screen gets lost. An example which still resonates is the daily television news in 1980 during the 1980 U.S. Embassy Hostage crisis in Tehran, Iran. The story, as I understand it, is that the latter daily demonstrations (Not the actual embassy takeover which was totally different but likely just as orchestrated.) and flag-burnings by a group of Iranians in Azidi Square was orchestrated to specifically fill U.S. tv cameras for the nightly news cycle. The cameras filled our television screen with what appeared to be violent anti-American demonstrations—night after night, week after week. But if one were actually in Azidi Square, a huge open space, the scene was not much different than a group of street performers doing their stuff, complete with folding chairs for the demonstrators on which to rest when the cameras’ red lights stopped glowing. In the actual reality of Tehran , the demonstration took place almost unnoticed in a tiny corner of Azadi Square. The three-dimensional reality is that beyond the tiny portrait captured on a 17” screen in America, there were families shopping, eating and strolling about the same as if it were Central Park in New York City. We have not yet learned, as a culture, how to close this technological book book or drop the curtains on our electronic devices. to turn off that suspension of disbelief. If we don’t learn to do this, then we’ll act as if what is real for one in one thousand people in the world population also becomes real for the other 999. And this does not suggest the extremist religious executions which occurred in France earlier this month were not real—they were and for those communities they were brutally three-dimensional, but were they more brutal than the executions in Nigeria, the Ukraine, the Middle East, or the AirAsia dead in Malaysia? They are real there, not here anymore than Daniel Day-Lewis as Abraham Lincoln is sitting here in our parlour. Let us mourn, let us weep, let us rage, but let us collectively act in a way that doesn’t throw the baby out with the bathwater. Do not mistake this as ignoring real threats. We have a three-dimensional ecological disaster we are inflicting on the planet, and therefore ourselves, but if we can’t differentiate between two-dimensions and three, we’ll act as if advertisers or Hollywood can save us. What might save us is learning to turn off the screen for chunks of time and take a few moments to use the senses to enlighten one of the finest creations our planet has ever produced—the human mind–to articulate and reason what exists in the neighborhood. As long-time Speaker of The House Tip O’Neill once said, “All politics is local.” One can shut off a device. Time to get out and smell, see, feel, taste and hear what is in the neighborhood. Act on that rather than acting as if hordes of zombies are storming the gates of Everywhere USA. Then when or if the zombies ever get to the gates of Everywhere USA, we’ll react based upon five senses instead of two.